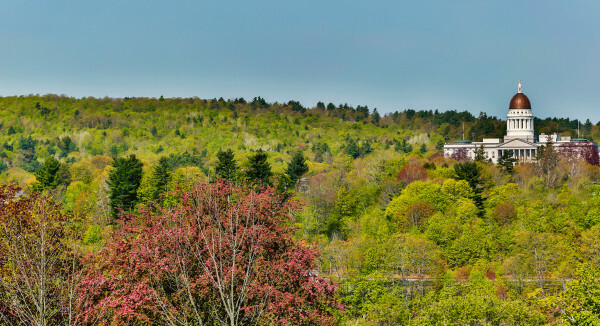 The 164-acre Howard Hill Conservation Area was purchased by the Kennebec Land Trust to be conserved and used as a place for low-impact public recreation. Gov. Paul LePage needs a lesson in property appraisals and market value. It has become clear in recent weeks that his complaints about Land for Maine’s Future have a lot to do with one land conservation project in Augusta and the appraisal supporting the $1.2 million transaction. That conservation project would preserve Howard Hill, 164 forested acres up the hill from the State House that form the backdrop to the capitol and abut a subdivision of higher-end houses. An appraiser hired by Kennebec Land Trust, the nonprofit group purchasing the land for conservation, estimated the land’s market value at $1.09 million in May, or $6,646 per acre. Kennebec Land Trust’s purchase price is $925,000 — $165,000 below the parcel’s appraised value. The total transaction with closing costs and other fees comes to $1.2 million. The state’s share in that deal, through Land for Maine’s Future, is $337,500. But LePage is convinced the state is paying too much. The licensed appraiser hired by Kennebec Land Trust, Jesse Studley, judged the parcel’s value as though it were ready to be developed for its “highest and best use.” Based on Studley’s analysis, that highest and best use — the realistic use for the parcel that would deliver the most value to the buyer — is residential development. Basing an appraisal on highest and best use is in keeping with the standards required of licensed appraisers nationwide and required by Land for Maine’s Future. That’s because a property’s market value is based on what potential buyers realistically would do with that property. “[P]otential purchasers will pay prices that reflect their analysis of the most profitable use of both land, as vacant, and property, as improved,” reads the website of one licensed appraisal firm, Duncan & Brown of Eugene, Oregon. Studley’s $1.09 million appraisal is backed up by 120 pages of calculations, documentation and analysis of the property’s assets, market conditions and comparable properties. In the document, Studley also explains why residential development is the parcel’s highest and best use. How does LePage back up his contention of a much lower value? “[T]he number the Governor has used for the value is the municipal assessment placed on the property by the City of Augusta,” Jonathan LaBonte, who directs the governor’s Office of Policy and Management, wrote in an email. Indeed, that number is much lower — $149,700, according to Augusta assessor Lisa Morin, not the $164,000 quoted by LePage. But it’s not supposed to reflect market value, particularly for a land parcel; city officials value properties for tax purposes based on their current use and condition, not taking into account market forces that could affect the amount someone would pay for the property. For Howard Hill, Morin said, the city judges its value as if it had one residential lot along with excess acreage — not as land outfitted for construction of a high-end subdivision. It’s not clear whether LePage actually hired a commercial appraiser to reevaluate Land for Maine’s Future properties. LaBonte didn’t respond to inquiries about a specially hired appraiser, nor did he supply appraisal documents when asked. The governor’s office has not yet fulfilled a Freedom of Access Act request from the BDN seeking the documents. As LePage continues to besmirch Land for Maine’s Future, it’s worth keeping this episode in mind. When the governor attempts to undermine the program’s integrity, he either does so without a basic understanding of real estate fundamentals or, worse, without any regard for them.